Black Friday is a strange, uniquely American sort of holiday. A celebration of ... shopping? There has been a growing backlash against Black Friday over the past few years. Some say the day is an empty idealization of consumerism and materialism, fraught with horror stories of tramplings and sad lines of people waiting for the big box store to open at midnight so they can grab a $20 DVD player. For some, though, it's a fun time to get up early and get a head start on the holiday shopping. What better way to beat Black Friday mega-store madness than by going local and supporting small businesses in Indianapolis? I say, let the shopping begin! "Our bookstore is a source of revenue for the not-for-profit organization Indy Reads whose mission is to improve the literacy skills of adults in central Indiana who currently read at or below the sixth grade level. One out of five adults can’t read the content on this website. The profits from Indy Reads Books go directly toward improving literacy in our community through Indy Reads." Wow, support a great cause and get some awesome gifts on Black Friday. It's a win-win! With locations on the Circle, Castleton, and the west side, you'll find an enthusiastic group of comic book and pop culture enthusiasts ready to help you find the perfect series for the special people in your life. Downtown Comics is Indianapolis's largest comic book retailer and has been in business for more than 20 years! Support the local comic scene and check out their fun events on their Facebook page. You may not think of Antique shopping on Black Friday, but if reusing, re-purposing and recycling appeals to you, then these stellar Indy antique shops might be the perfect spots to add to your list. This is one of the finest antique malls in the Midwest. Here you'll find an abundance of antique and vintage history, luxury, creativity, and fun. From furniture to clothing and accessories, vinyls to electronics, collectibles to brand new items, the mall's more than 200 booths offer an array of different items that allow you to explore for hours with something new around every corner. Located near the center of downtown Indianapolis in an old warehouse, Midland Arts & Antique Market has been a destination for over 16 years and also been voted "Best Antique Store" many years running. Midland has over 200 independent art and antique dealers from around the Mid-West in their expansive four-story brick warehouse. Find something unique for the children in your life. Avoid the mundane super stores, as well as the crowds, with these fun and quirky local shops that specialize in the perfect gifts for kids. Call ahead to see if they have any Black Friday sales or special hours. Located on the north side, this family owned book shop carries a great selection of children's books, toys, and more. They're known for their expertise and events. Check their Facebook page for upcoming appearances at community events, where they may bring a fun activity for everyone to enjoy. They also host story times, activities, and birthday parties in their Zionsville store. Voted #1 children's store on Indy A List, Mass Ave Toys is THE premier toy shop in Indy. This storefront, located in the middle of Massachusetts Avenue, offers plenty of floor models for children to play with while you shop. Need help picking out the right gift? The friendly staff will point you in the right direction. 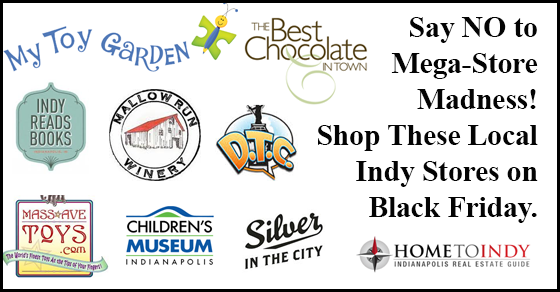 Plan a trip to the world's biggest and best children's museum, right here in Indianapolis, and be ready to shop for imaginative gifts, stuffed animals, toys, books, Legos, and games. Don't have time for a visit? You can shop online! Right now they're running an online special offer on purchases of $40 or more. This garden-themed shop in Carmel is a relaxing stop on your list of Black Friday destinations. You'll find a secret garden with pathways of wonder to explore when you visit My Toy Garden. Wind your way through seven unique areas designed to help you and the learners in your life discover their interests and talents. Some Indy neighborhoods are known for their local shopping districts. Find a small café and check out these special spots for chic shopping. Just southeast of downtown, this funky Indianapolis neighborhood has vintage and antique shops, a world of restaurants, working artists and a vibrant arts scene, live music and performance, and one-of-a-kind stores that sell comics, musical instruments, home decor, fresh flowers, and so much more. Visit Fountain Square any time of the day or night. Known affectionately as Mass Ave, this five-block area is ripe with theaters, restaurants, art galleries and, most attractively for shoppers, a number of eclectic, independent boutiques. Don't miss the highlights, including Stout's Shoes (the nation's oldest shoe store, established in 1886), Silver In The City/At Home In The City (offering silver jewelry and unique gift items), and The Best Chocolate In Town. Load up on hand-crafted delectables and local vintages at these shops that are sure to please any palate. If you're ready to get away from the crowds and the city on Black Friday, but still want to get a few things for the holiday season, the perfect retreat on the south side. Located in Bargersville, south of Greenwood, Mallow Run is a family-owned farm and winery with a rich history and was recently voted the #1 winery on Indy A List. Mallow Run is a stream whose waters wind their way through this family farm and flow past the winery on the way to the White River. Its namesake, George Mallow, settled this farm in 1835 and some time after built the barn where the tasting room is now located. Seven generations later, his family still lives on the farm and wishes to share their corner of the world with you! Ahhh, now that sounds like my kind of Black Friday. The name just says it all. The Best Chocolate In Town was founded by Elizabeth Garber, who brought her fine arts background and my love of chocolate together to create this specialty chocolate company. All of their chocolates are hand-made and hand-packed at their commercial kitchen and retail space on Mass Ave in Indianapolis. You can visit the retail space or shop online for gifts. What are your favorite local places to shop around Indianapolis? Add your go-to spots to our list in the comments below!